Rice paddies glisten through the mountain mist as I weave into the valley below. Beyond the haze, I hear Hmong voices chattering as they trace a well-worn trail; I glimpse dark figures treading between the clouds, wicker baskets of produce strapped to their back on the way to market. 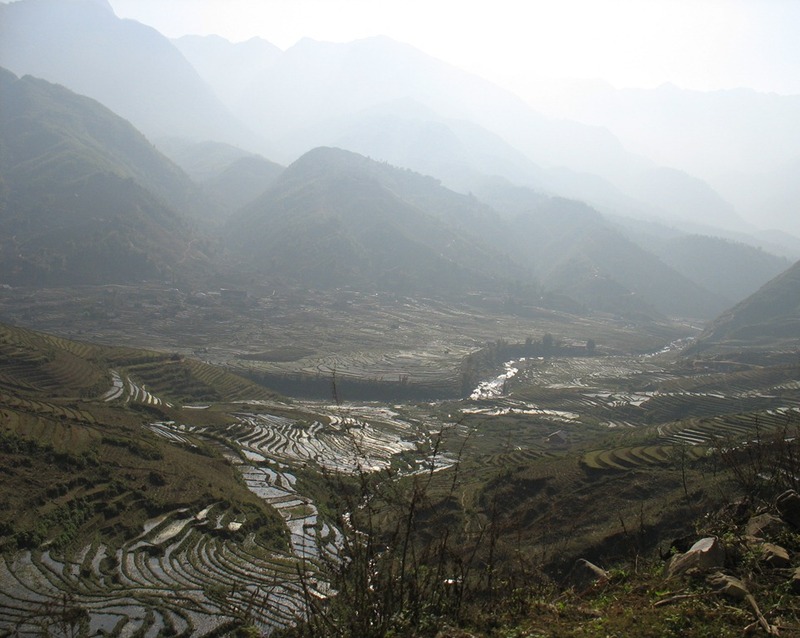 I was enchanted by this northern Vietnamese landscape the moment I left Sapa town yesterday. Local school teacher come part-time tourist guide, Tân, accompanied me on my first walk. He had an infectious passion for the local tribes and cultures, and in the six hours we spent scrambling along steep mountain passes, overlooking villages signalled with grey chimney smoke, Tân briefed me on the complexities and charms of local life. I learnt that half of the local population belonged to the black, green of flower Hmong tribes; there are 12 different tones or ways to say ‘a’ in Vietnamese; primary school students are aged five to fourteen; and, most of the surrounding communities survived off their produce and crafts. At the edge of each village, between the bamboo thickets and lapping paddies, I was greeted by flurries of small children. I drank the sweet nectar of sugar cane, freshly hacked from the edge of our trail. I drank tea with some farmers while sitting next to a bull. 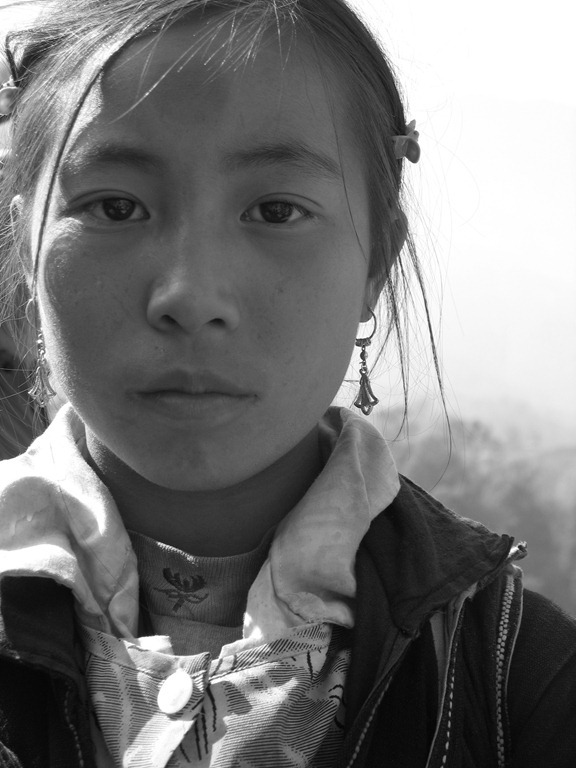 And as the sun reached the centre of the sky, I was joined by a small Hmong girl selling bracelets. Her deep eyes of liquid black stirred my heart, and although we barely shared a word in the three hours she walked by my side, I felt like we bonded over the trail, the landscape and the delicate beaded jewellery that jangled at my wrist as we waved goodbye. Welcome back Nic! Hope you’ve recovered fully. We miss you! Thanks Lela. Still on the mend actually. Slowly, slowly. I’m planning to be back with regular posts and better than ever soon. Thanks for your patience – so nice to know you are reading. Your writing fills my heart. I am glad that i have stumbled across your blog. I think i will enjoy reading your posts. Thank you for brightening my morning. Thanks so much Shane. Feedback like yours is makes blogging extra enjoyable. Happy to brighten your morning! Thanks for your lovely comment! Vietnam is such a beautiful country with lovely people – I’m glad you enjoyed my post about Sapa and find inspiration in my travel stories. All the best with your studies and future travels! I really enjoyed reading this. It brought my own memories of Sapa back. Such a beautiful country. Look forward to reading more of your posts!